This political environment obviously makes compromises and "bipartisan" solutions very difficult, since the parties, more so than at any recent point, simply see matters of state in fundamentally different ways. But the polarization among lawmakers in both chambers also, as Ezra noted yesterday, "makes it virtually impossible to govern in a system that is designed to foil majorities and require a constant three-fifths consensus. It's not good if the country is virtually impossible to govern. Problems don't stop mounting while we try and figure things out." There's been some talk lately about the effort to convince at least some Republicans to support health care reform, the way plenty of Republicans support Social Security and Medicare in previous generations. In those eras, the parties were closer together, and there were center-left GOP lawmakers from across the country who were amenable to outreach. The thing is that we've always been polarized in various ways, just not politically --- city/country, north/south, rich/poor, native born/immigrant, white/black. It's just that there are times when our two party system doesn't break down along those neat lines and basically represents two big tents comprising bits of each side of each divide. Indeed, we have that right now on some very important issues such as the high finance and national security. So the polarization is not really complete even in polarized times like these. But we are polarized politically on much of our domestic policy, even as much as industry spends to buy off members of both parties. This is where the ideological/culture wars are played out in this country, even to the extent that we had a real live civil war over the most thorny polarizing issue in American history. I think we actually have two different countries in many ways and when it breaks neatly into the two parties, as it would naturally tend to do at times, it creates gridlock if politicians fail to recognize the state of play and use it to their advantage instead of clinging to outmoded coalitions that no longer reflect anything meaningful. The Republicans actually did that during the Bush years and had they not fallen prey to hubris and gross mismanagement, they could have lasted a bit longer. (Maybe that's inevitable with a party that is based upon the idea that government is just another profit center, I don't know.) But they did master the institutions and ran them in a partisan fashion and I'm not convinced that if they had had a president who had a genuine mandate (as opposed to a very dubious ascension to the office) and an administration that was not obsessed with fighting old wars and avenging old slights, they could have had a much more successful run. They understood power in ways that the Democrats don't. FDR did(and he sometimes overreached too, as we well know) but he did use the power of his mandate and his institutions completely and thoroughly and didn't follow some irrelevant social models of propriety over effective governance. 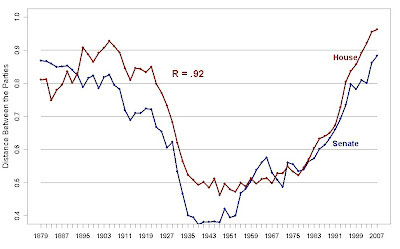 And the interesting thing about that graph is that during the depression, there was much less polarization. The American people know from a four-year record that today there is only one entrance to the White House by the front door. Since March 4, 1933, there has been only one pass-key to the White House. I have carried that key in my pocket. It is there tonight. So long as I am President, it will remain in my pocket. You can't help but wonder if people today heard a little more of that and little less bipartisan kumbaaya over high taxes for rich people and industry being "too big to fail," if the polarization might just drop a bit. In fact, when you read that, you have to wonder the problem isn't polarization at all, but whether the country just isn't polarized in the right way.